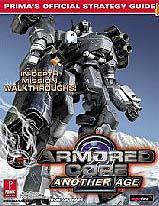 Get a complete list of weapons and upgradeable parts available to you with ARMORED CORE 2: ANOTHER AGE PRIMA’S OFFICIAL STRATEGY GUIDE. It will provide you with extensive maps and walkthroughs to help guide you through each mission, as well as tactics to beat rival mech players. In ARMORED CORE 2: ANOTHER AGE each mech has it’s own special ability, and there are limitless variations of the types of mechs you are able to build. PRIMA will give you the inside scoop on how to earn credits for mech upgrades, including tips to defeat your opponent in the two-player arena mode.